The Place Picture this: a crowded club with throbbing music, dimmed lights, funky furniture, and balls. Fresh balls, flavoured balls, big balls, even small balls. Lots and lots of balls. Club Meatballs is way cooler than your usual after-work hangout, because it owns that very special overlap of great food, neat drinks, and amazeballs (hur, hur) interior design. Chinese New Year will herald a new age of great eats and hot shots here. Plump your lips and ready your stomach, because you are in for one crazy ride of flavour explosions! The Food Steve Jobs was spot on when he said “Stay hungry”. This is one advice you’re gonna wanna follow with the upcoming dishes at Club Meatballs – we began our night with the Pulled Pork, Chilli and Purple Slaw Sliders ($13) and Wagyu Beef, Gorgonzola and Onion Marmalade Sliders ($14). I have to admit straight up that I usually avoid meatballs at good restaurants in favour of other dishes, but these sliders are a great start to a good night. The pulled pork is tender and chewy, the purple slaw refreshing and crunchy. Life, to me, is all about balance, and the richness of the pulled pork is in perfect balance with the delicate bite of the purple slaw. Wagyu beef is a hot shot today, almost as ubiquitous as Taylor Swift’s songs. Aside from the hip-as-anything indie playlist (we heard Vance Joy’s Riptide and reminisced about Melbourne), the gorgonzola on the beef sliders was quite a mouthful. To taste the medium-rare quality beef with the creamy and medium-strength cheese, paired with the soft and crispy buns…we were off on a high. If you were expecting a gentler dish after, you are as wrong as we were. Next up was Huevos Con Chorizo, a Spanish dish of crushed Omelette with Chorizo and slices of toasted Ciabatta. Apart from pronouncing this dish name with our tongues rolling, hair flipping, and arms a-flourish, we crushed them eggs with gusto and piled them on our plates. This dish is served in a sizzling pan, and the strong flavours, salty and musty and hearty, is nicely suited to our local palette. I for one shamelessly took all the charred edges of the egg for myself, because chao ta is the way to go. Ready for more? We continued our foray into gastronomical funfair with Sobrassada and Gorgonzola Bruschetta ($10.50) and Ricotta, Mango, Walnuts and Honey Bruschetta ($9). These were the most surprising concoctions for us. The Ricotta, Mango, Walnuts and Honey Bruschetta ($9) is surprising simply for its mixture of ingredients. The combination of these disparate items almost seems like a stir-fry of sorts. It is unlikely your stir-fry would taste this good though – The Ranter really liked this one for how the fragrant sliced mango played off the smooth cheese and the bite of the walnuts. Believe it or not, we were only at the starters at this point, and because we doubted how much more we could eat, this meant we could eat more. Loosen your belt, and fire the mains. 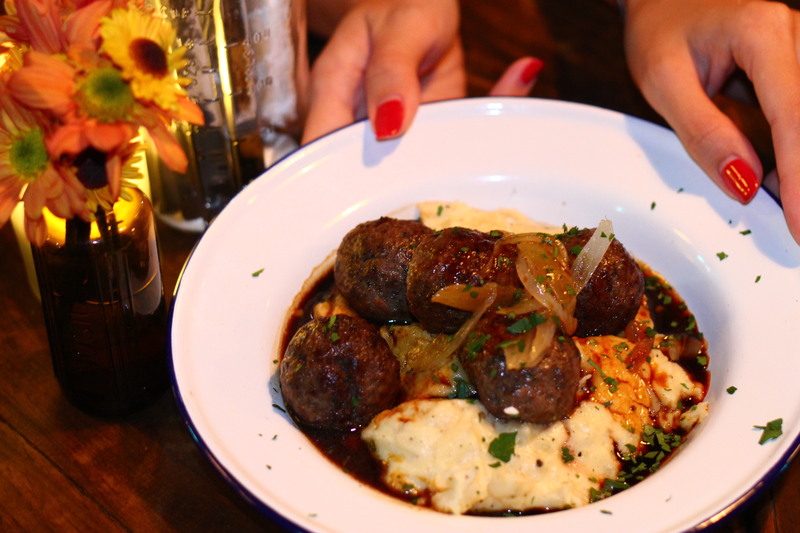 The Wagyu Beef and Rosemary balls with Onion and Red Wine sauce, served with Mashed Potato ($19.50) was The Ranter’s preferred main. The meat goes perfectly with the understated red wine sauce and the mashed potato that is equal parts creamy and smooth, and chunky and chewy. Yes, that happened. Mash that is creamy and chunky, both. The mash, I tell you, the mash. Eyes brimming with fat, veins bursting with joy, hands trembling with anticipation – it was time for dessert. Lemon Merengue with caramelized Pineapple and Pistachios ($12) is served in a jar, quaint or quaint? The frothy sweetness of cream softened the sour punch of pineapples. A grand end to an epic meal, if you ask me. Which you didn’t. But you should. My favourite dish of the night: White Chocolate Cheesecake with Almond Crumble and Berries ($12). First up, know that this cheesecake is dense, smooth, and still light. Equal parts cheesy and white chocolatey. Almond crumble is light, firm, crunchy, with a strong presence in bite. Makes the texture of the dessert that much more satisfying. And the berries, rich in colour, small in size, big on flavour, round off this dish with the seductive lie of healthy eating, and the knowing truth of a sweet, delightful night. Full disclosure: at one point in time, I averaged three spoonfuls per ten seconds. I wish I was kidding. No night out is complete without drinks, and we got our liquid courage with Espresso Martini ($17) and Gin Basil Smash ($17). The team behind Club Meatballs also helms Sarnies and The Lokal, both good places with great food – and, as Ben reminded me many times, the best coffee in Singapore. Fancy your caffeine with extra punch? You know where to go, now. The Espresso Martini ($17) with that extra punch. My Gin Basil Smash ($7) was a happy marriage of gin, basil and lemon, and kept me refreshed throughout my meal of epic proportions. Our friend ordered the Negroni ($17), a mix of gin, Gran Classico, and CarpanoAntica. It came in a small glass with one big ice ball. I think the ice ball looked really cute. It was a strong drink. In between dishes, we were happy to catch up with Ben, one of the owners, who shared with us how he really likes authentic, good food that is affordable for everyone. Club Meatballs was set up in collaboration with a cutting-edge furniture provider, BW Furniture, and in addition to the main dining area, there is also an event space where you can enjoy a cuppa, share desk space with other bright minds, and “stay as long as you like”. Exact words. You know where to while away your afternoons now, you hipster indie entrepreneurial monsters. Rants I wish there was more veggie. Ben says they have Pimp Your Salad for the daytime crowd, and that nights are for sin(ful food). Sigh. How? Will I Return Again? To head somewhere for my salad fix, then share co-working spaces in those slow days, and adjourn to a cozy hangout with good music for great comfort food…I think you should ask: Will I Ever Leave? Great Review! I like your style of writing…. Can’t wait to read more of your food reviews.